Now that I work a mere nine miles from my house, I decided I should try riding to work. With three bikes in the stable, I don't think I am ready to try and pick up a road bike to become the fourth, especially after buying the 'Horse, I didn't think another bike purchase would go over too well. Instead, I decided to convert the Fixation to a Single Speed road commuter. The only things I had to purchase was a 13 tooth cog and a pair of Cross Tires. I got the cog from the Bicycle Goodie Shop in Bethel and the tires from Kenda's Online Tire Outlet, which by the way no longer sells tires individually. The probably figured it wasn't worth the work for all these individual tire orders. Oh well, I got a few sets of tires this way. Of course, before I even started to do all of this I had to have the bottom brackets and cranksets switched out. As a mountain bike, my Fixation had a bash guard for going over rocks and logs so that the front chain didn't hit those obstacles and get damaged. Not to mention a bash guard is pointless for road riding. So I switched that out for the Shimano cranks on my Qball. Speaking of the Qball, I replaced the Manitou Splice fork with the Qstick (a suspension corrected rigid 29er fork) and was hoping that I would be able to use one of my myriad of stems that I have collected but that darn head tube on the Fixation is so long that I had to resort to the Avid SAAGO stem (which is adapted for short steering tubes and works with collar instead of the normal way with a cap). Resurrected an old pair of pedals when I tried to ride with cages on my Trek and I kept the disc brakes but felt they were overkill. Found my bag of reflectors and crafted up both front and rear additions. I have had a flashing taillight for years but never had a use for it, that is until now. The only question was, what to do for a front light. Well, my father-in-law just returned from a trip to China and brought me a compact LED light that I was able to use parts from the bag of reflectors to fashion into a mount for the bars. Below is the first rendition of my commuter. The Kenda Kross tires have reflectors painted on them but I added plastic reflectors, too. Now I have a good use for the seatbag that I was afraid of using on the trail. Due to its size, it's idea for holding my work ID or my black berry. The QStick looks really good and it creates a comfortable riding position because even though I am not using a 29inch tire, the higher crown makes my body more level in the cockpit. A colleague at work suggested the best way to commute to work, so that you not stranded at work without a car is to drive in with your bike and ride home that night and then return in the morning. Of course, there are some logistics involved in preparing for that, probably no more so than if you were to just ride in the morning and go home on the bike at night. Essentially a change of clothes has to be left at the office. I made the first trip home taking the most direct route (show above in blue and called ShortestWayHome) without riding any main roads. The only exception to this route was that I did have to ride on Rte 25 for a half mile and a probably another quarter of a mile on Currituck Rd, while not a main thoroughfare, is still quite a busy road. 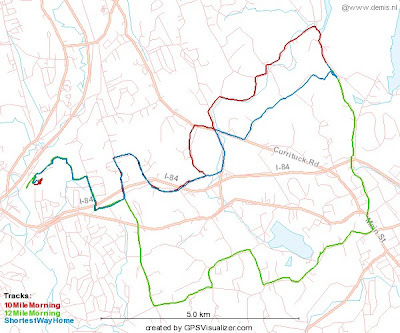 My first ride in the morning back to work followed the Pond Brook River Valley (10MileMorning route in red). To minimize my time on Route 25, I have to climb the hill half way to Brookfield and turn onto Farrel Road. At some point, I am going to try climbing up at Tower Road and then winding through some neighborhoods to get to Rte 25 and then cutting down West Whisconier to Stony Hill to see if that minimizes riding on Rte 25 at all. I did try to do an all day ride, a few weeks ago, by which I brought all my clothes in to work, plus another set of riding clothes in case I hit some weather on the ride in or got to sweaty to wear the morning riding clothes back in the afternoon. On Friday October, 12th, I rode into work on balmy, foggy Friday morning. There was rain in the forecast and I thought it would be fun to test out the recent modifications I had made to the commuter. I found another route (12MileMorning) that minimizes travel on Route 25 but adds miles and climbs to the overall route. There are two big climbs, the first is the three miles up Hanover Rd and then there is a shorter more steeper climb up Castle Hill Rd. The route cuts through the west part of Newtown, into Bethel, crosses over Route 6 and then on into the office park. I found that riding back roads when its dark to be pretty bone jarring, especially when you don't see half the potholes and pothole fillers so I swapped out the Qstick to a RockShock Jett that got from junker frame someone dropped off at the house thinking I might want to play around with it or strip it for parts, which I did and then built it back up but that's another story. I think the Jett Fork has somewhere between 65 and 80mm of travel but its pretty stiff so I figured it wouldn't soak up to much pedal efficiency but still might take the edge off the bumps (and it does). Also added a bell, rear view mirror, fenders, GPS mount for my Garmin GPSMAP60, and I switched out the disc brakes for a pair of Avid Singledigit cantilever brakes. I got some white, Demolition brake cables from the Bicycle Goodie Shop to give the bike a more customized look. The fenders are more for mountain biking and not so much for commuting but I figure if I ever got rid of this bike for an actual commuter, I could always move them over to another bike. I had always intended in using the cantilever brakes on this bike but what I was trying to do was find a white, powdercoat fork for the front where I would use the front black brake and then in the back use a white cantilever brake to get a little black and white theme going on. Never found the fork that I was looking for on eBay so I had to settle for what I have now. As I mentioned earlier. It was a great ride in that morning. The warm weather was really nice and I wore a sleeveless jersey but that afternoon the rain came and it was raining too hard to ride home. I probably could have done it but it would have been a risk and the biggest fear is not in my ability or slippery conditions, but the idiots behind the wheels of cars driving too fast on these back roads I am riding. So, I left the bike in the office and got a ride home with a colleague from the office. Earlier this week, I left the car at work again, rode home in the evening and road back to work in the morning. Weather was still nice and I could still dress lightly. I estimate that I am probably saving one to two gallons of gas for each round trip but the cardio vascular benefits totally outweigh the monetary savings, by a long shot. Not to mention the training benefits, afterall, I am riding single speed! One thing I have found with the current fork is that it moves the front end of the bike much lower. I ordered a Profile Designs Riser Stem with a 135 degree rise and a 120mm length. The Stem looks kind of like a Fertility God, if you know what I mean but when I put it no the Fetish, it raised the front bars a good three inches which I think will make a big difference. A picture of that will be fourth coming. Besides finding a pair of used Crank Brother's pedals to ride clipless, I think the last thing I need now is a better lighting system. I purchased a rechargeable floodlight from Lowes the other day that I am going to take apart and see if I can fashion into a DIY light but at some point I might consider an actual bike light that is made for both commuting and off road riding.